Today’s guest on CSReview is a young and promising filmmaker and actress Athena Baumeister. A native of Cleveland, Ohio, Athena has successfully emerged into the world of “Young Hollywood.” A true jack of all trades, Athena has had roles in various short films and commercials and made her directorial debut with the short film Who’s Suffering More. 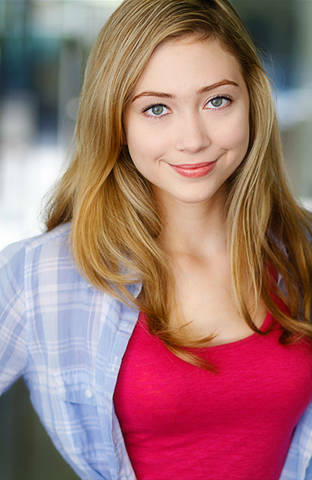 Her directorial granted her the title of Prize Winning Short Film by Providential Film Festival and thus encouraged her to direct Caroline’s Crush, which was submitted to Kids and Teen Filmmakers in 2011 and awarded Best Film in her age group. Athena’s versatility with directing, singing, and acting has made her into the teen world’s popular new commodity. As a triple threat, Athena is a force of nature to be reckoned with. She is currently working on two web series. One is Correction House, a corky comedy series where Athena plays the character Rachel Butler, an adolescent neighbor who is living next door to a group of recently reformed convicts. Her second web series Facility House is currently in post-production. Camilla Stein: Welcome to CSReview, Athena! A budding talent, you are in today’s spotlight as an award winning actress and film maker. Why did you choose cinema? If cinematography would not be available, what would it be? Athena Baumeister: Cinematography is a unique medium for expression. I love music, writing, and a lot of other media as well, but filmmaking really lets me express myself. I enjoy all the aspects of filmmaking—the visual arts, cinematography, directing, acting, writing, and so on. Making a film lets me do all of these at once. Camilla Stein: Athena, what would be your ultimate role in film? Anything classic or perhaps a challenging avant-garde? Athena Baumeister: Currently, my dream role would be something that involves playing someone who is seriously mentally disturbed, possibly wicked. Camilla Stein: What’s the best book you’ve ever read that made the most profound impression on you? Best film you’ve seen? Why? Athena Baumeister: I’m just starting to read some of the great classic books in school this year and I love how they make me think of universal themes. At this point, it’s hard to pick a favorite. I really liked 1984. It was interesting to see the dark vision of how people thought the future would turn out. Currently, I’m reading Bill Bryson’s A Short History of Nearly Everything. I absolutely love it! I think it tends to be a director’s body of work rather than any particular film in general that makes an impression on me. Directors that have had an impact on me include Tarantino, Burton, and Hitchcock. Camilla Stein: Today’s world is taken over by social unrest and many acute issues. Does this concern the young generation – your generation – and if it does, where do you see your place as a young voice in the global demographics? Do you want to advocate for a cause? Athena Baumeister: I think the Occupy movement and Kony 2012 are great examples of how young people can really impact the world. I think it’s important to get involved in social issues that matter to you. Personally, I’m an animal lover, and whenever I see or hear about animals suffering it upsets me deeply. I think it’s important to support local no-kill animal shelters. Camilla Stein: The Oscar – the Academy Award that is the Everest of every actor, director, producer, anyone involved in making quality film. Are you ready to work hard and even harder for your Oscar Award? What qualities do you think are essential for becoming a real pro in your field? Athena Baumeister: Like you said, the Oscar is the Mount Everest in all aspects of filmmaking. I think it’s important to have more realistic goals to start with. It’s wonderful that there are an increasing number of film festivals specifically designed for young people and budding filmmakers to receive recognition for our early projects. Of course, someday, it would be nice to get an Oscar, but if I ever do, it will take years and years of dedication and hard work to get there. Camilla Stein: Your special message to our young female readers? Your advice on how girls can become empowered to go get their dream. Athena Baumeister: It seems to me that nothing is important as hard work and persistence. You can be extremely talented but never get anywhere or do anything great if you don’t put the effort in. Camilla Stein: Thank you for a great conversation, Athena! Wishing you a great journey in your career in film.